Through the collaboration the researchers have developed a new antimicrobial agent, epidermicin, which could be used as a nasal spray to treat a number of infectious diseases, including those caused by MRSA. The project took a major step forward in September 2018, when Professor Upton launched a spinout company, Amprologix, to drive the potentially life-saving work. The company leading the project, Geothermal Engineering Ltd, hopes the plant will supply up to 3 MWe (Megawatt electrical) of electricity, enough energy to power 3,000 homes. While developments take place on the site, researchers from the University’s Sustainable Earth Institute, including Post-doctoral Research Fellow Dr Hazel Gibson, are undertaking independent research into people’s perception of the new technology and what it could mean for their neighbourhood. A spinout business founded on University biomedical research is developing groundbreaking new water testing products. Molendotech Limited has developed an innovative assay that is able to rapidly identify the concentration of faecal bacteria in water without the need to wait days for laboratory results. Working in both salt and fresh water, it can deliver results in a matter of minutes, significantly improving the ability to identify and track any pollution source. University spinout Fieldwork Robotics signed an agreement with leading UK soft-fruit grower the Hall Hunter Partnership (HHP) to expand development of its harvesting robots. Founded by Lecturer in Robotics Dr Martin Stoelen, Fieldwork is creating innovative robots capable of picking a range of fruit and vegetables. Dr Craig Newman, from the University, and Dr Rupert Noad, from University Hospitals Plymouth NHS Trust, have developed an award-winning app that helps to carry out dementia screening tests. ACEmobile is the first tool of its kind, supporting doctors and nurses through the whole process of a common dementia screening assessment known as the Addenbrooke's Cognitive Examination III (ACE III). A free-to-use iPad based tool, the app has been developed using human factors testing to reduce the error rate when used in routine clinical practice. A University spinout company secured a major grant to support the development of a vaccine to combat one of the main causes of mastitis in cows, E.coli. As well as being a significant financial issue, the disease is also a serious problem in low and middle-income countries which rely on milk as a staple food source. An effective vaccine would remove the need for farmers to use antibiotics and cut the risk of the bacteria developing antibiotic resistance. The Vaccine Group, which was co-founded by Dr Michael Jarvis from the University’s Institute of Translational and Stratified Medicine in collaboration with commercialisation partner Frontier IP (who have worked with the University on a number of other spinout companies this year), will use the £50,000 grant from the global Bacterial Vaccine Network to run a proof-of-concept study. A new project, Plant Factory Cornwall, aims to use artificial lighting powered by solar energy to create the best possible conditions for fruit and vegetables to flourish. Scientists believe it will reduce the stresses plants face in normal conditions, while improving global food security and reducing food miles. It could provide a particular boost to farmers and growers in Cornwall. Sited on the University campus, the project is based within a multi-tier production unit constructed in partnership with SolaGrow, a company based just outside Penzance. The project is funded through Agri-Tech Cornwall, a three-year £9.6 million initiative part-funded by the European Regional Development Fund, with match-funding from Cornwall Council. Plymouth has joined other South West universities to work with Watershed in Bristol and Kaleider in Exeter to expand the use of digital technologies in the region. Supported by a £6.5 million grant from Research England, the new Creative Technology Network , the new Creative Technology Network brings together universities and industrial partners to pool research and innovation expertise to developing cutting-edge practices, techniques and products in creative digital technologies. 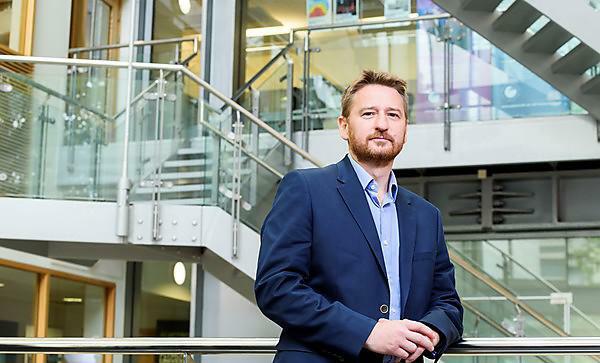 Over the last five years, the University of Plymouth has helped South West businesses access approximately £2 million of investment for Knowledge Transfer Partnership (KTP). In 2018, the University launched a number of new Knowledge Transfer Partnerships (KTPs) with South West businesses. One of these is a collaboration with Cornwall-based business Alan Harper Composites. A Plymouth graduate and KTP Associate is helping the business develop innovative and more environmentally-friendly commercial methods to repair composite materials. The company is internationally renowned for its reusable vacuum membrane, which has been used in the flooring of Germany's ICE fleet trains. In 2018, Plymouth Electron Microscopy Centre (PEMC), headed by Director Dr Natasha Stephen, launched its latest piece of equipment. The new Focused Ion Beam Scanning Electron Microscope (FIB-SEM) is only the second in the country to be made available for commercial use by a university. It can simultaneously scan, analyse and mill through a range of materials, creating digital 3D models at a nanoscale. Thanks to a £1.7million grant from the EU’s European Regional Development Fund, more than 40 Devon businesses will get free access to the equipment between now and the end of 2020. The first commercial user of FIB-SEM was Devon based firm Plessey Semiconductors. The new kit is unveiling new levels of detail that will help Plessey continue to develop micron scale LEDs for future lighting and display technologies.